The Onzie Spirit Bra Top has an elegant high neckline and perfectly crossed straps at the back. Functionality meets design with this Onzie sports bra. This yoga bra top has a high scoop neckline, provides more coverage and uses high-tech fabrics in a beautiful way. Yoga wear at YogaHabits! 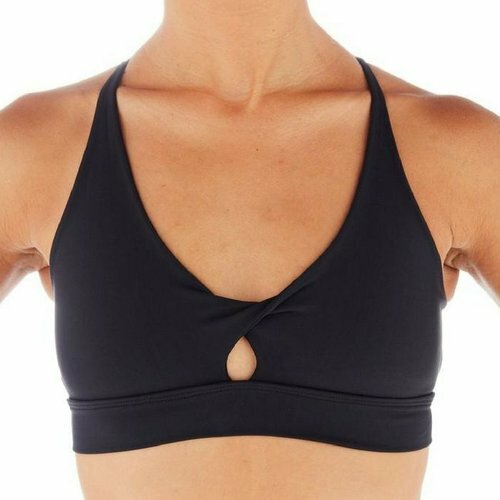 Find trendy yoga bra tops perfect for Bikram & hot yoga. Check Onzie's new X Back Elastic Bra Top with multiple crossed elastic straps. The Onzie Wrap Bra Top features an elegant multi-banded racerback and V-neck. 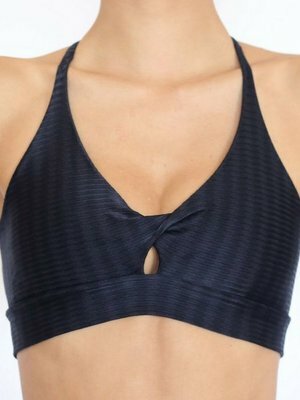 This yoga sports bra top is stylish, supportive and made of high-tech fabric. Fashion meets sports bra in these Onzie X Back Elastic Yoga Top. With multiple crossed elastic bands for stylish support that keep your shoulder blades free. Chic, sporty bra top by Onzie. The darted front and baby V-neck shapes the body while the narrow racerback makes for an elegant, athletic look.